Developers of air-movement mechanisms such as fans and compressors must consider the basic relationship between fan or impeller speed in rpm (revolutions per minute) and volumetric air flow in CFM (cubic feet per minute). While these machines have different operating principles, their common characteristic is that each revolution of their spinning input shaft will result in a certain amount of volumetric air (or gas) flow through them when they are operating as designed according to their pitch or displacement factor. Muffin fans are rated for CFM of airflow. 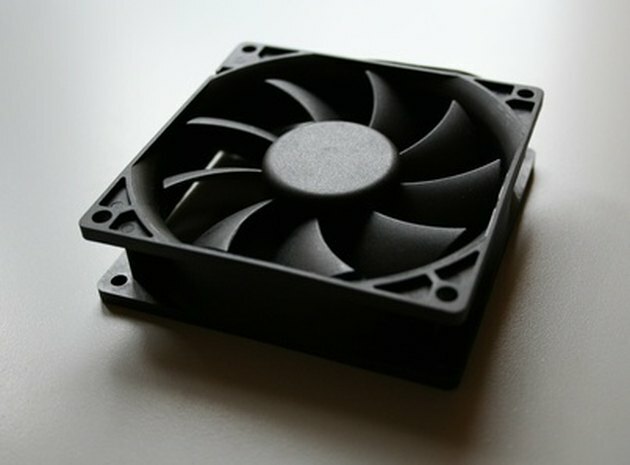 The amount of air this fan pushes can be calculated. 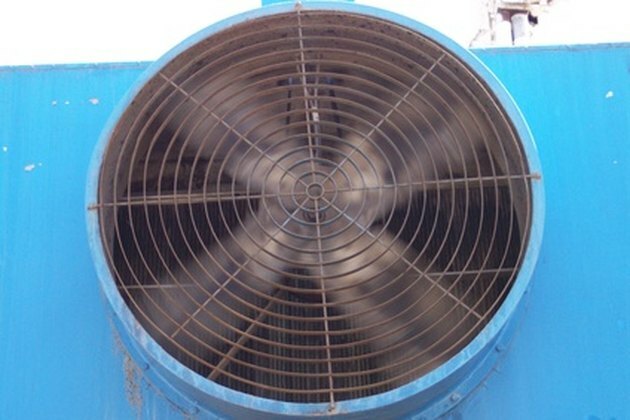 Define the axial fan application. According to the general fan law governing axial fans, you will need to know the fan blade diameter and pitch (blade tilt or attack angle) along with the rpm variable to calculate CFM. 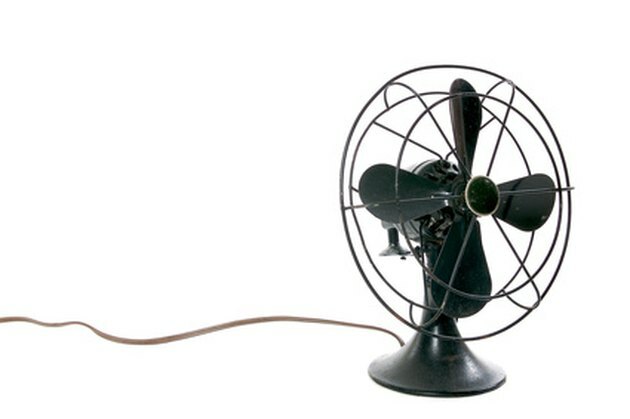 In this example, a small household fan on a stand has a three-bladed plastic fan with a 1-foot diameter and an 8-inch effective pitch. 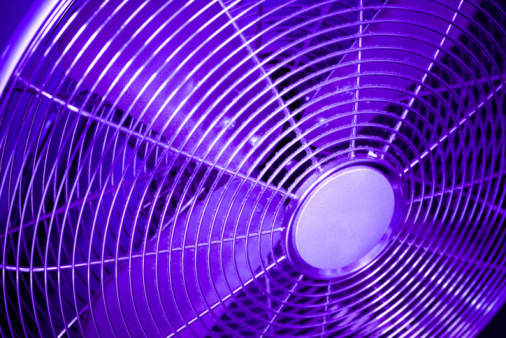 This means that each revolution of the running fan blows the one-foot-diameter column of air coming through the fan 8 inches toward you after accounting for efficiency losses. The fan is running at 1,200 rpm. Guards over fans slow airflow. Calculate the linear velocity of the air through the running fan. If each revolution moves the air 8 inches, then 1,200-revolutions per minute multiplied by 8 inches means the air 9,600 is being moved at inches per minute, or 800 feet in one minute. Another way of looking at it is that the fan is moving an 800-foot-long column of air that is 1 foot in diameter through space each minute. Calculate the CFM (volumetric flow of air) at 1,200 rpm. The volume of the column of air described in Step 2 is pi (3.1416) x fan radius squared (0.5-feet squared) times the column length in feet. This would be 3.1416 x 0.25 square feet x 800 feet = 628.32 cubic feet per minute at 1200 rpm. 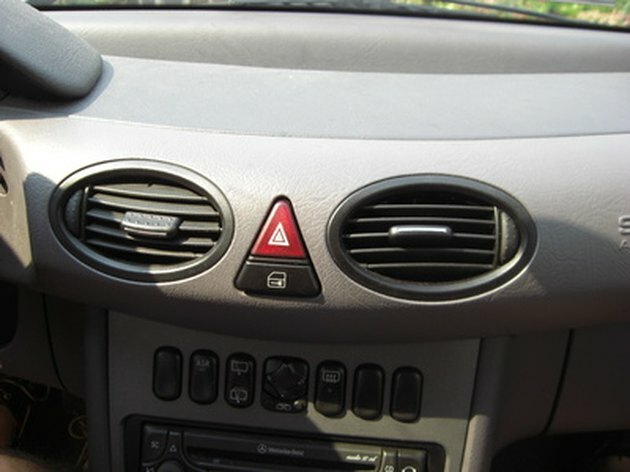 Automotive air conditioners use centrifugal blower fans. Define the blower application. In this example, the centrifugal blower in a window air conditioner circulates 600 CFM on the "LO" setting when the blower motor is spinning at 800 rpm. You can calculate how much air would it circulate in "HI" mode, when the motor rotates at 1200 rpm. 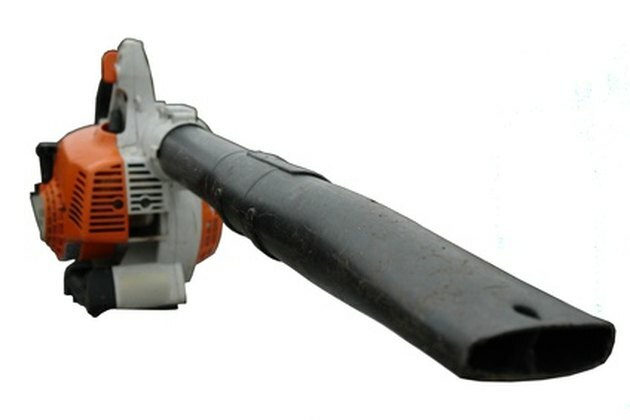 Leaf blowers also use centrifugal blower fans. Define the terms in the general centrifugal fan formula and rearrange them to use the formula to solve for the higher air flow: CFM 1/CFM 2 = RPM 1/RPM 2 x (D1/D2)^3 (cubed). The (D1/D2)^3 is 1, since the impeller diameter stays the same, so CFM 2 = CFM 1 x (RPM 2/RPM 1). Define the compressor application. A shop compressor with a piston in a cylinder has a net displacement of 10 cubic inches. It normally turns at 600 rpm. You can calculate many cubic feet of air it takes in at atmospheric pressure and the approximate cubic feet of compressed air it supplies if it has an overall 10-1 compression ratio. Calculate the incoming volumetric air flow. If the compressor takes in 10 cubic inches of air for each revolution, then CFM input = 600 RPM x 10 cubic inches/1728 cubic inches/cubic foot = 3.47 CFM. 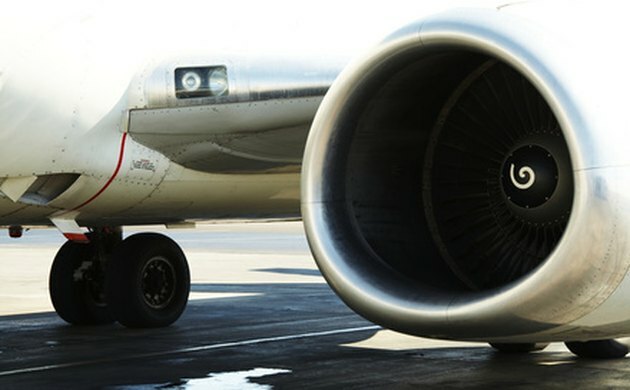 Jet engine fans take in huge amounts of air. Calculate the outgoing compressed air volumetric flow. Since the compression ratio is 10-1, the compressed air would be supplied at 3.47/10, or 0.347 CFM.